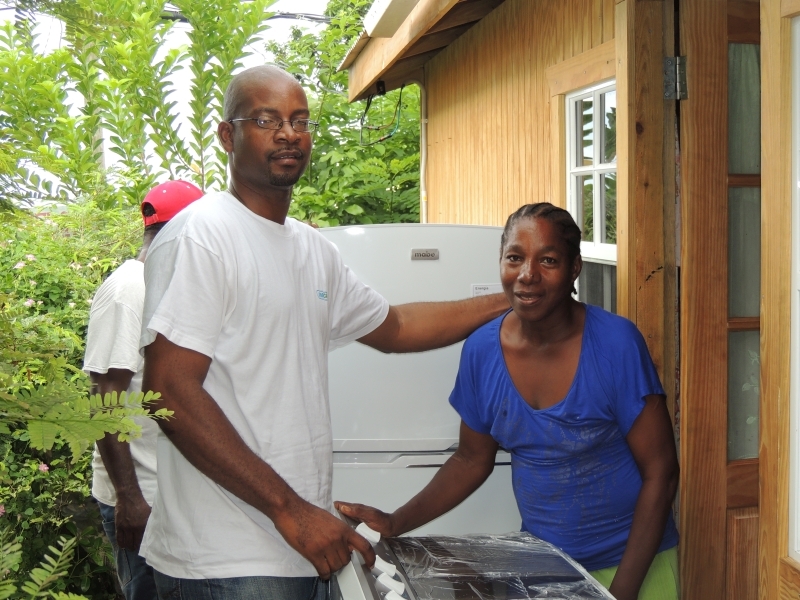 Last Saturday, Fontenoy Resident Ms LeslieAnn Francois, received a donation of a fridge, washing machine, and an iron from FastCash. Ms Francois is a victim of a stroke that rendered her incapable of working. As a former client of FastCash, the company decided to help her in whatever way possible. Ms Francois, despite her condition, has never given up on her dream of constructing her home. The Government of Grenada made that dream a reality earlier this year. However, Ms Francois was badly in need of some furniture and appliances. On realizing the need, the management and staff of FastCash embarked on a project to ensure that the former client is comfortable and free of unnecessary stress. For the past two months, FastCash has worked along with other private sector companies to raise funds, to ensure that Ms Francois got the much-needed items. Prior to last Saturday’s event, the staff of FastCash were able to successfully execute a fundraising barbeque and bar at Wall Street, Grand Anse on 3 July. The company was able to raise over $6,000 through sales from the fundraiser, and donations. From the proceeds of the fundraising project, FastCash was able to provide her with furniture, get the house equipped with electricity, and last Saturday presented Ms Francois with the electrical appliances. The items were handed over by FastCash Country Manager Stephen Joseph, who expressed how pleased he was to be a part of such a project, because it has an immediate impact on a family and will satisfy their needs for a very long time. He went on to say, that arguably, this is the greatest thing that the company has done in regard to corporate citizenship based on the support it has gotten from the public, other private companies, and FastCash staff. This has also proven that the Government and private sector can work together to provide social support to persons in the community.